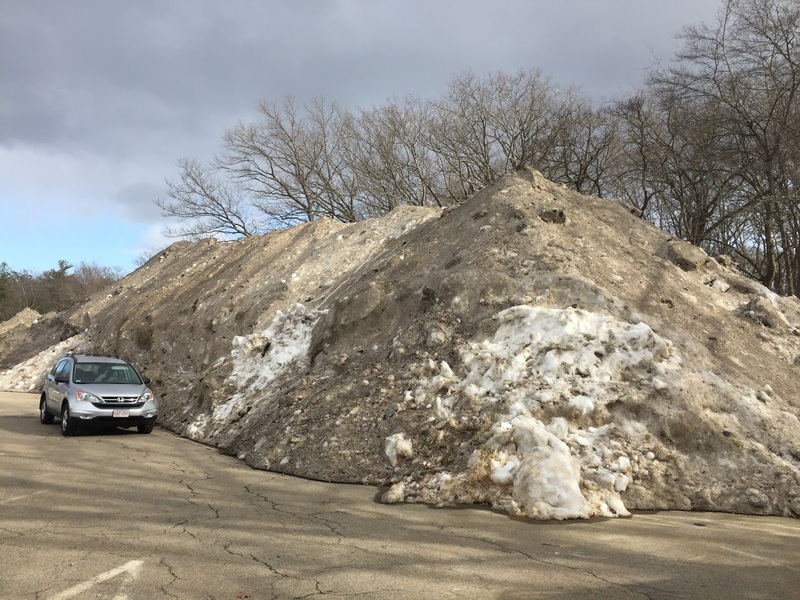 Giant snow mounds still towering in our parking lots in late April remind us of the three powerful northeaster snowstorms that made this past March one of the snowiest on record. 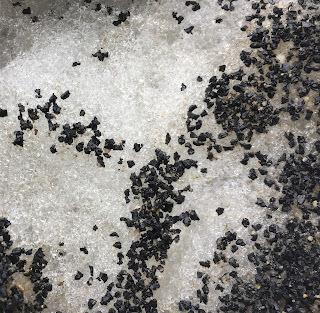 Government departments and large landowners are no longer allowed to dump excess snow into rivers, the ocean, or other bodies of water because of salt, trash, and possible toxic materials that might be intermixed with the snow. So they create mountains of snow that melt in the spring. This year’s snow mound on the Hammond Pond Parkway in Newton was enormous; a 300 foot long, 48 foot wide, and 21 foot high wall of snow. Making some simple assumptions, this mound was about 5000 cubic yards in volume, or 400 dump truck loads of snow. In late March the parkway mound was dirty white, but it has now become blackish, as the snow melted, leaving behind sand, soil, and other debris on the convoluted and eroded surface. Much of the surface dirt is jagged, rice grain-sized fragments of black rubber; this is probably “crumb rubber” used to provide cushioning on athletic fields. The surface of the mound also has scattered grass clumps, large rocks, logs, sticks, chunks of concrete, and metal and plastic junk. Three weeks ago, the air temperature was a pleasant 55 degrees, and the nearby forest floor was 62 degrees where it was warmed by the sun. In contrast, the snow mound surface was a chilly 36 degrees and a frigid 28 degrees 6 inches below the surface. Water dripped from the sides and small springs of icy cold water emerged from the base of the mound. Most of the water leaving the mounds was probably evaporating and sublimating directly from snow to airborne water vapor. It is a fun game to guess when the giant snow mounds might finally melt in the spring. 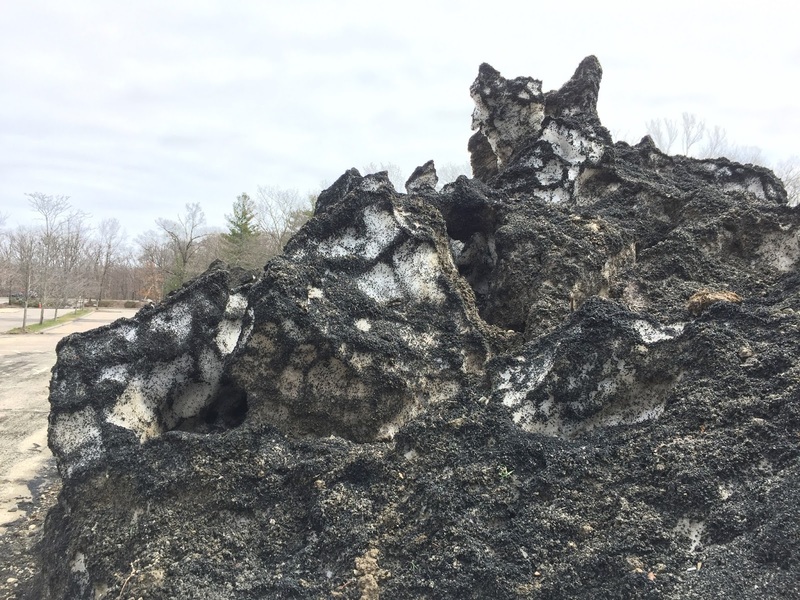 We will probably have many more opportunities to observe the melting of such snow mounds—because of climate change, winter storms are predicted to become more frequent for our region. This posting is a summary of longer article published in the Newton Tab. “Nothing so fair, so pure, and at the same time so large, as a lake, perchance, lies on the surface of the earth." Walden Pond, like the rest of the world, is now quite different from what Thoreau knew 160 years ago. We have become a force of nature in our own right, and the story is written into Walden's muddy layers, as we describe in a recent article in PLOS One. In Thoreau’s time, Walden Pond was a low nutrient pond of crystal clear purity. By studying six sediment cores extracted from the bottom of the lake, we showed that soil running off from disturbed shorelines, along with human wastes associated with swimmers, appear to have increased nutrient levels in the lake during the past 70 years. This has allowed algae to thrive, reducing the clarity of the water. Efforts by the park department to protect the lake's purity have thus far kept it from turning green and murky. But hotter summers and more swimmers will favor even more algal growth. Recommendations to maintain and improve water quality include (1) reducing the swimmer-impacts through education programs, (2) stabilizing eroding banks, and (3) monitoring water quality and lake vegetation to see if there is any improvement or deterioration.